Here is a brief introduction to Tess, the Gardener. 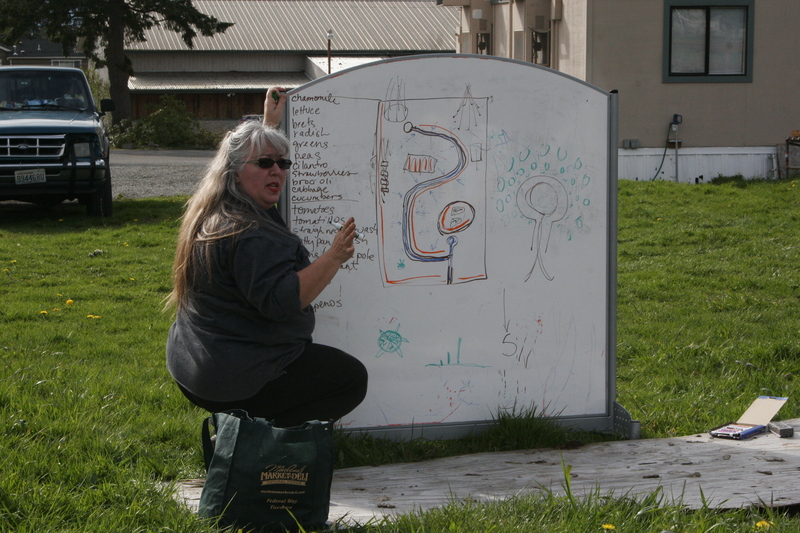 I first met Tess at the Meaningful Movies of Renton events; she has been a loyal supporter of them from the beginning. Over time we have come to know each other as like minded neighbors that want to make a positive change in our community. I had the pleasure of visiting Tess’ house the other day. 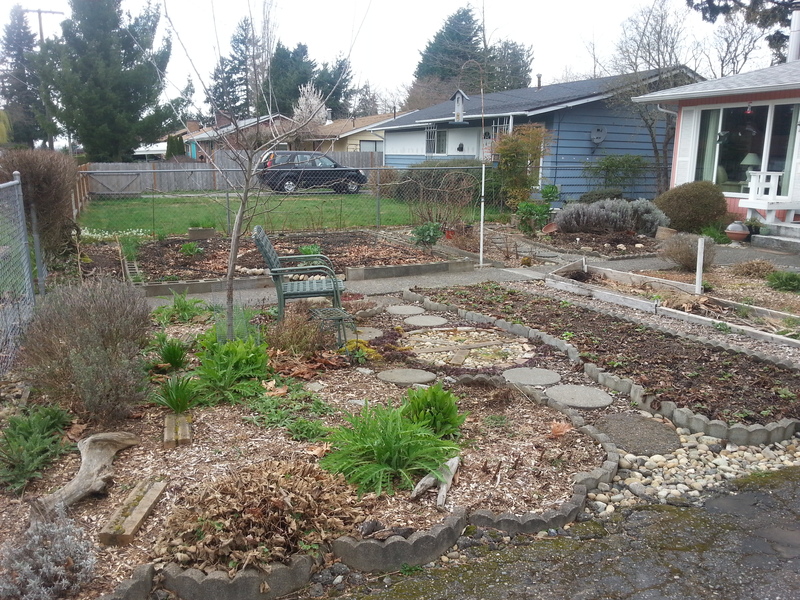 When I parked in front of her house located in the Renton Highlands area, I was immediately struck by how the yard has been replaced by garden space to grow things. She had a multitude of berries and bulbs, kale and collards. 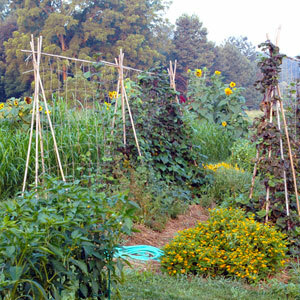 She confessed to having been influenced by the recent permaculture workshop, led by Laura Sweany, to change the shape of her current garden bed into something a little more in tune with nature-she went from planting in a traditional row pattern to creating a spiral gardening bed. 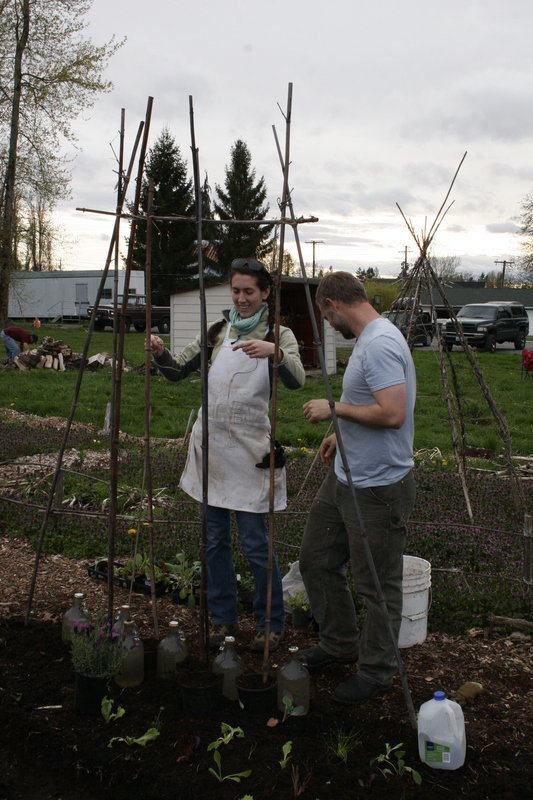 This shape lends itself to more cohesion towards how plants might grow in the wild. This is also a great strategy for confusing pests that may want to attack one crop, for if that crop is sprinkled together with other crops, than the damage is greatly reduced. 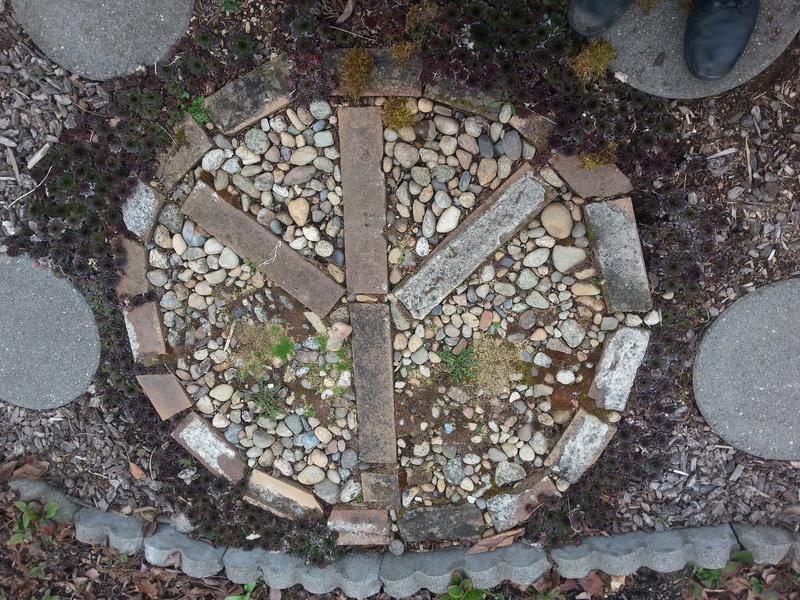 Of course, I noticed the peace sign made from brick that had been incorporated into her walkway through her yard. My kids loved it too. 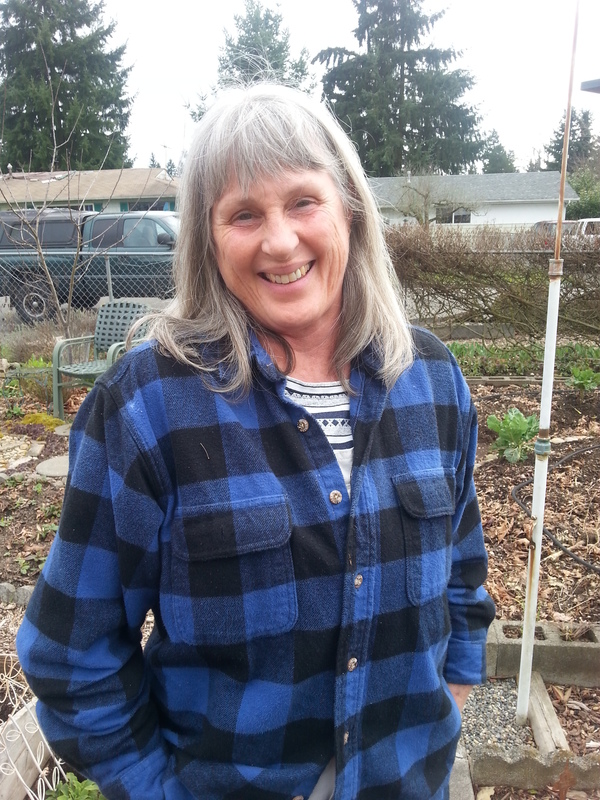 Tess had chickens in her back yard and two compost systems-one used for kitchen scraps and the other for chicken manure. I was also blessed to get a taste of Tess’ homemade chili-yummy. 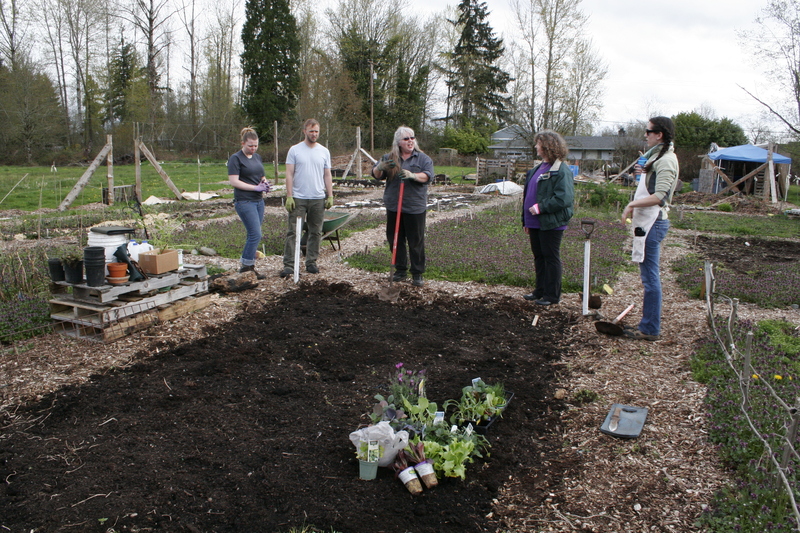 I have to say that this is a shining example of one of the products of being involved with Sustainable Renton-community. Although it was a short visit I was left with the feeling that we were more connected to one another and how absolutely grateful I am to belong to an organization that fosters a healthier community through fostering healthier relationships with our neighbors.